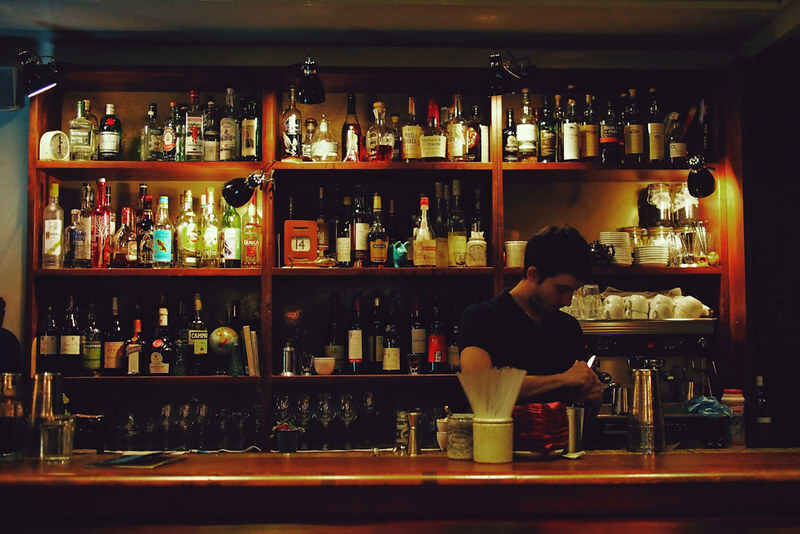 It was my birthday this week, and rarely for me I was paralysed by indecision on where to go have dinner on the day. 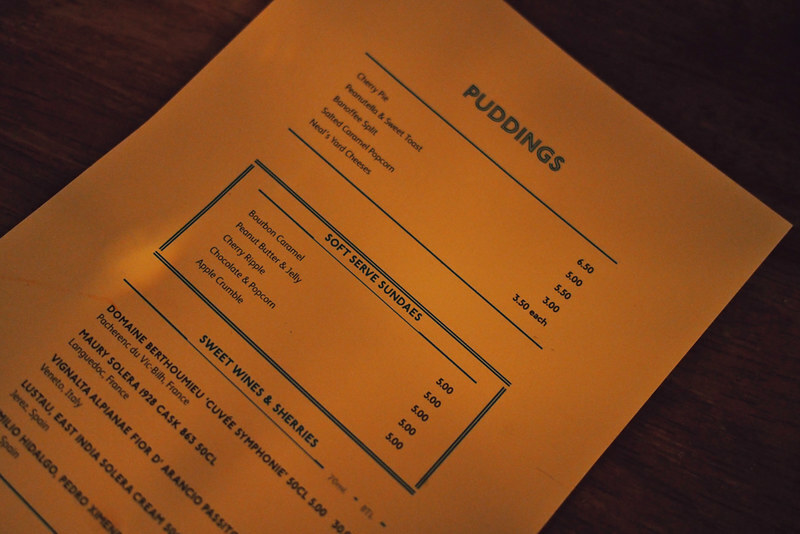 I’d nearly resorted to an old favourite (Polpo, Dishoom or Yautacha) before booking Foxlow, the newish place in Clerkenwell from the guys behind Hawksmoor. Yes, the meaty, steak-y Hawksmoor that I could never go near with a barge pole. 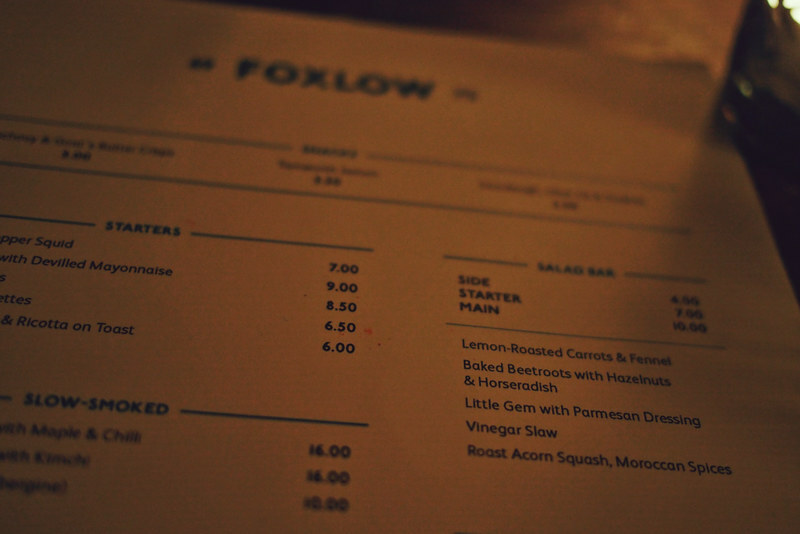 Luckily Foxlow is not all about the meat, though it still features fairly heavily on the menu, but there were enough veggie options to keep me and my veggie-for-January boyfriend happy. 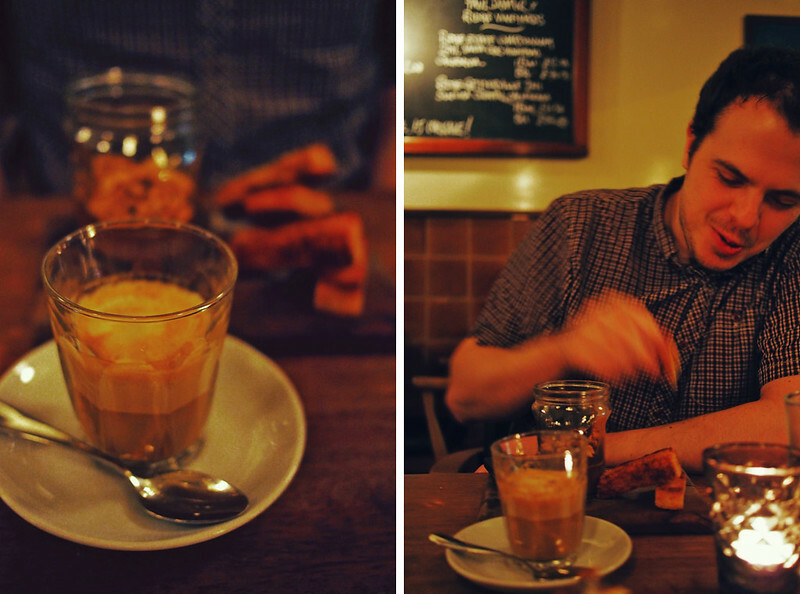 The cocktails, vino and service – and mighty desserts – made me even more happy. Win the first: our booked table wasn’t quite ready when we arrived, so were treated to a complimentary drink in the bar area while we waited. I went for a St John; I don’t remember what exactly was in it (we’d been to three cocktail bars prior to dinner) but it was delicious. Josh was happy as the beer list is strong, with local London breweries Partizan, Beavertown and The Kernel amongst the offerings. Once seated, we went for every veggie thing on the menu to share. The waiter helpfully guided us, even pointing out that the parmesan on one of the salads was not veggie. I was delighted to find that they even have my favourite wine, Le Petiot, which we first had at the Corner Room and is offered by the glass or carafe here. 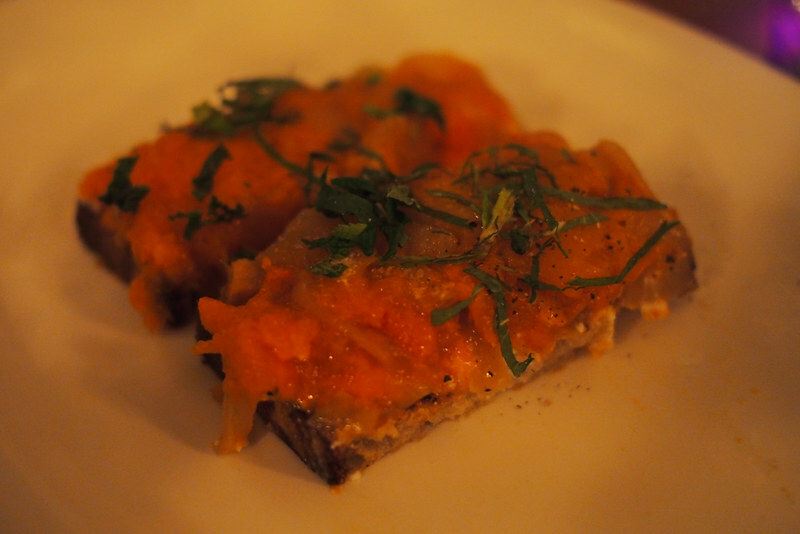 We started with a butternut and ricotta toast. Unusually served at room temperature, the perfectly caramelised onions amongst the sweet squash meant this was destroyed pretty quickly. The mains were imaginative and skilfully executed. 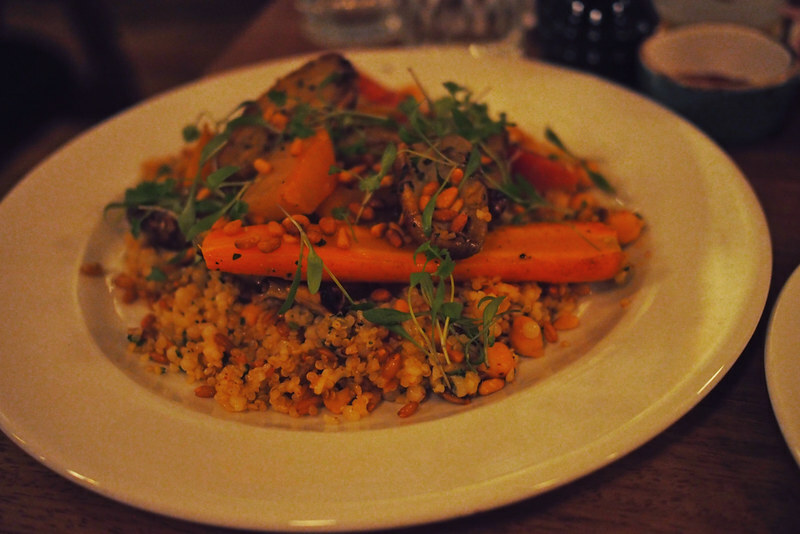 A dish of roasted vegetables and grains was more tasty than it sounds, with a mix of seasonal beetroot, artichoke and carrot amongst nutty and toasty grains. The Imam Bayildi was a superb example of the dish, the aubergine smoky and super soft, stuffed with a spiced tomatoey mixture with a dab of yogurt on the side. 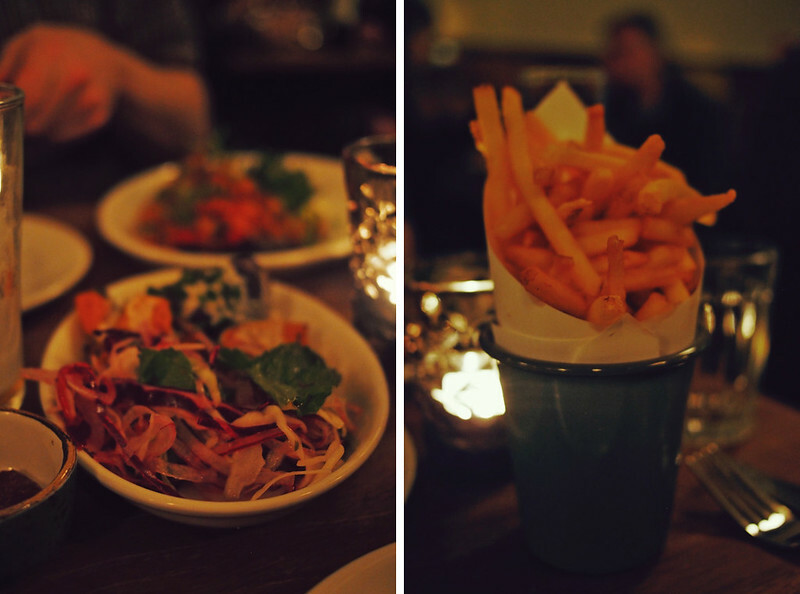 We also got two of the salads from the salad bar (which colourfully greets you as you enter the dining room) including a zingy sour slaw, and uh, chips. Really good crispy, salty chips. With kimchi ketchup. oooof. 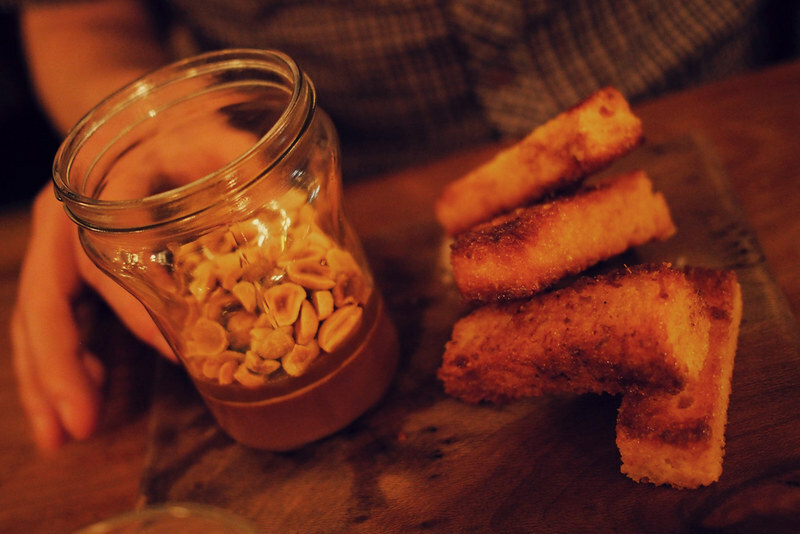 We went for the Peanutella, served in a jar with a layer of salt caramel and served with filthily buttery brioche soldiers. I can famously usually only manage a mouthful of sweet things, but I would happily have licked this jar clean. And a chocolate-popcorn soft-serve sundae. A superluxe McFlurry basically. Yeah. No words. They even have good coffee. I’m glad that’s becoming a thing now. 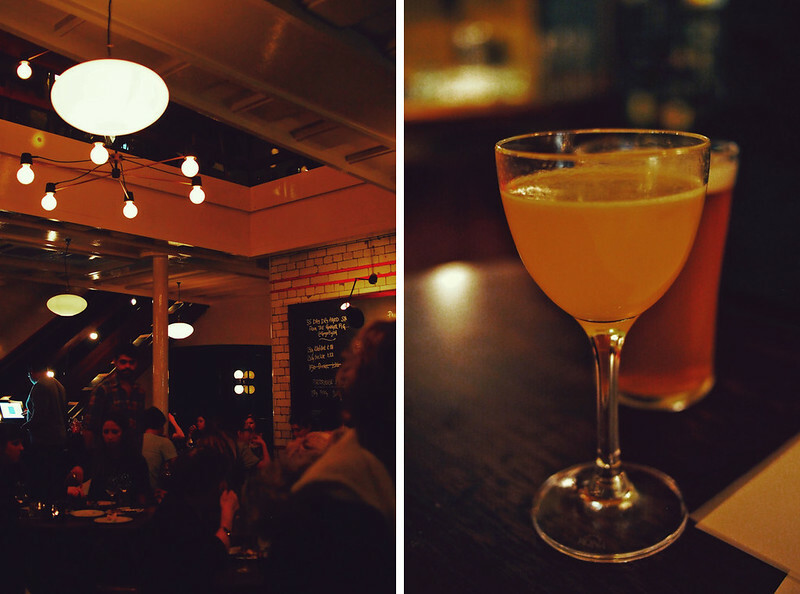 Everything as Foxlow is just done very well, but it never feels stuffy or pretentious. I can completely understand why it’s tricky to get a table at the moment. I hope they change up the veggie menu regularly so I can go back and try more soon. Though I’d be fine with just the chips and a sundae really, thanks. Looks delicious. One to keep on the list for future visits. Hope you had a lovely birthday. Looks delicious Katie, would it be wrong just to go for the chips and that peanut dessert?! Don’t forget a cocktail! All the major food groups covered, I think. 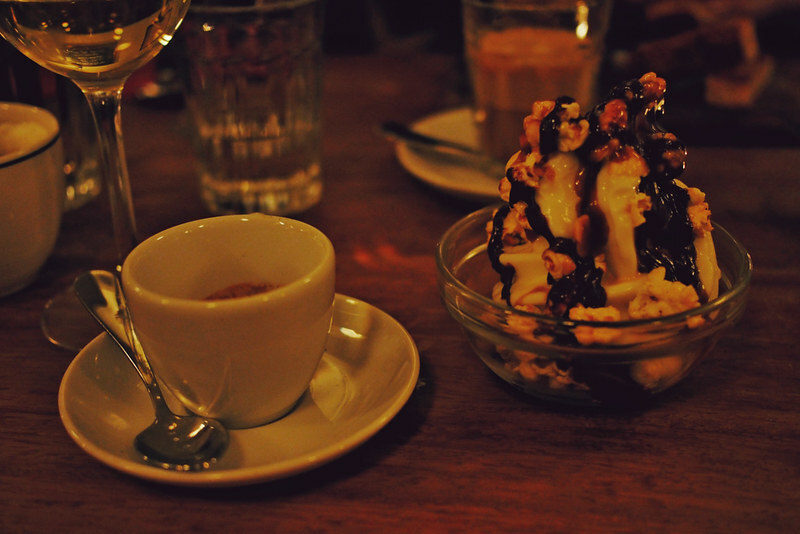 O that dessert looks so divine! Yum, looks fabulous. Nice of them to give you a complimentary drink too. The Peanutella is so unusual – I’ve never heard of anything like it! Looks absolutely delicious though! Wow, that sundae looks fantastic! Happy belated Birthday! I love your bicycles flotation and I empathise with the sewing notions taking over. After s year at the kitchen table I have just ordered a studio room for the garden. My own sew just by space again, hurray!